I'm just loving this new fall collection that Little Yellow Bicycle sent me to create with. And let me tell ya, fall is a welcome site about now. We're still in the mid-90's here in Texas so the thought of cooler weather is exciting. Key word is cooler, not cold though. This new collection is very versatile, from scrapping memories of home to the obvious fall events. I chose to scrap about my cute little Indian at her Thanksgiving program at school. They dressed up as Indians and Pilgrims and had a lovely feast. They sang songs and were just WAY too cute! 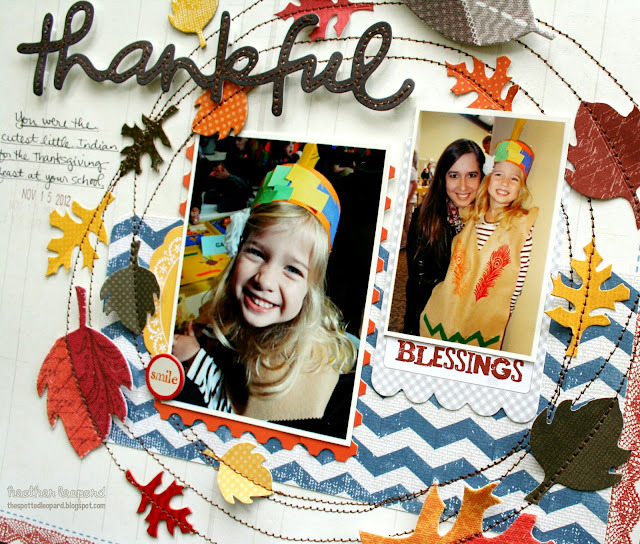 This collection has an amazing assortment of leaves, from die cuts, to chipboard, fabric and sticker leaves, they are wonderful. The colors matched the feathers on my daughter's costume perfectly so I scattered them around her photos and added a tree limb at the top to create the swirling, falling leaves effect. The title was a breeze with the new die cut words. I just stitched over it in brown thread to give it a little extra oomph and then journaled below. So, what's the weather like in your neck of the woods? Is fall setting in yet or is it still hot or if you're on the other side of the world, maybe it's Spring/Winter. Hmmmm. I'd love to know what you think and would love it even more if you'd visit me on the Little Yellow Bicycle blog TODAY! Love this! Love the leaves and all the stitching! That stitched circle of leaves is fabulous!!!! I'm just loving this layout, the stitching on the title and leaves is fantastic! Amazing, Heather! I love everything you create! Love your layout ! and at this point I would even take cold weather. The temps are supposed to be back up near 100 here in my part of TX by the end of the week. BLECH!! At least it rained. oh--I LOVE all the stitching, LOVE this sweet layout! Wow... what a beautiful page! I loved it! What a gorgeous layout! Love the detailed stitching and the colors on your beautiful design! This is great! Love the circle, leaves and stitching detail. Lovely, I'm currently filling a scrapbook and had run out of design ideas. 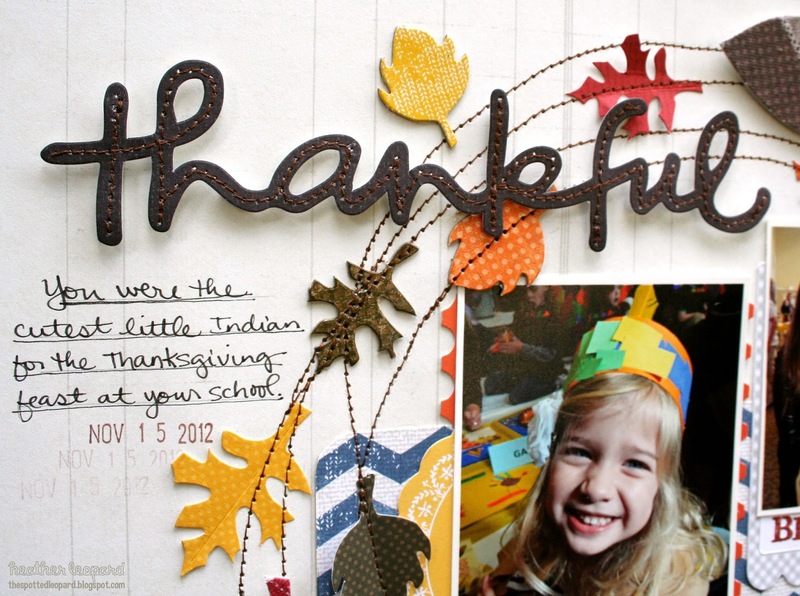 I just love how you decorated yours specially the stitch which had suited the autumn leaves. Better get working with my haberdashery kit. Smile, I'm Guesting at October Afternoon!